New band vibration particles filling machine, weighing hopper discharge belt vibration can be dispensed fine powder, the powder can be achieved not stick weighing hopper. Automatic packing weight measurement, multi-functional packaging, suitable for many types of goods, stainless steel housing, the appearance of fine high-end. All intelligent design, simple operation, infrared sensor switch sensor block discharge, sophisticated sensors quantitative, three grade shock blanking, adjustable, microcomputer motherboard more energy-efficient, durable, fast, error is small, high performance, filling the bag installed around one minute depending on the package 25 items, 1 grams -25 grams quantified among several pro grams can adjust the settings according to their needs above board in the computer. 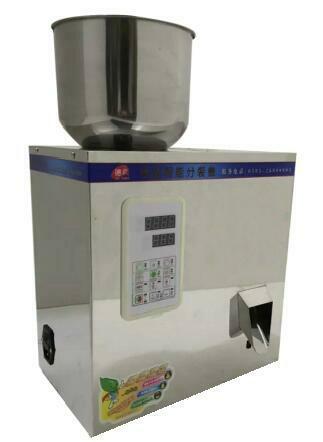 The machine can be converted one grams -100 grams type conversion costs 150 yuan, the specific pro can contact customer service. Fine powder; flour, milk powder, walls powder, chemical powder, edible powder, coffee powder, the powder, coarse particles, Iron Goddess of Mercy, herbs, seeds, food, sesame seeds, grains, wolfberry, rice, monosodium glutamate, salt, spices, beans, chemical components, electronic components, hardware components, etc.